If you are having problems logging in to the RideCheck site please contact our Customer Care department at (702) 228-4800. 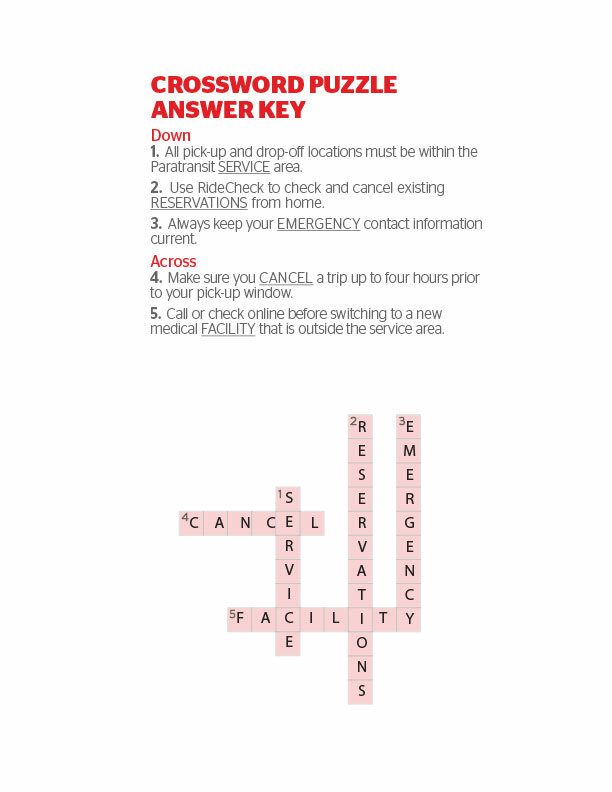 Click here to learn more about RideCheck. Select request for information topic and provide your Paratransit ID# and specific question. Additionally, if you want to book more than one ride, we recommend that you allow at least two (2) hours between trips to avoid the possibility of missing your return ride. RTC recommends that Paratransit customers ‘Call Before You Move’ to ensure all pick-up and drop-off locations are within the Paratransit service area in order to continue to receive Paratransit service. Call or check the online interactive service area map HERE to verify your desired trip destinations are within the service area. Find answers below to the Summer Paratransitions crossword puzzle! Regional Transportation Commission of Southern Nevada © 2017 | (702) 228-7433.